Accelerated degree courses: assessment of impactImpact assessmentThis assessment considers the impact of increasing the annual fee cap for accelerated degrees – on provision, uptake, and outlayReview of TEF: terms of referencePolicy paperThe terms of reference sets out the objectives of the independent review and how it will work with other TEF developments.The Secretary of State has appointed Dame Shirley Pearce to be the independent reviewer with administrative support from the Department for Education. She will also establish a small advisory group comprising relevant experts to provide advice and help inform her review.The independent reviewer will seek views from stakeholders to inform her review. A consultation will launch soon and will provide a mechanism for stakeholders and users to provide feedback and suggest ideas to inform the review.Basic need allocationsGuidanceBasic need funding is the money given to local authorities each year to help them fulfil their duty to make sure there are enough school places for children in their local area.The allocations announced in 2018 will allow local authorities to create the new school places they need by September 2021.College staff survey: 2018Research and analysisResearch on improving workforce data in further education (FE) based on surveys and questionnaires returned by staff in general further education (GFE) and FE specialist colleges in England.These reports analyse the experience and expectations of teachers and leaders in further education (FE). 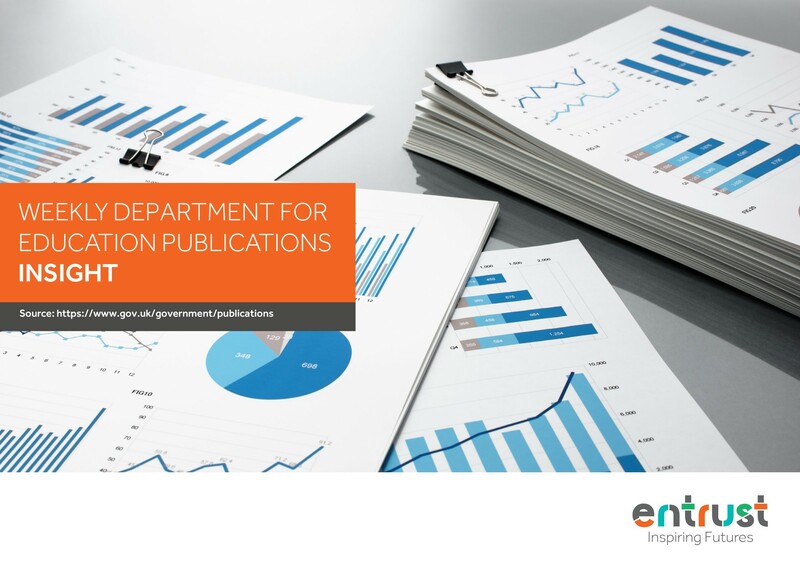 The research is based on information returned in:principals’ surveysteachers and leaders surveyscollege staff questionnairesThe Department for Education (DfE) will use the findings of this report to improve workforce data. A follow-up survey will take place in 2019 to find out why staff changed role or left the FE sector.FE learners and apprentices surveyResearch and analysisThis report provides a detailed picture of learners’ and apprentices’ journeys, including:a detailed understanding of the background of FE learners and apprenticesinformation from learners and apprentices on their experiences and perceptions and outcomesThis study also sought to obtain consent from respondents to match their responses to the longitudinal educational outcome (LEO) dataset, allowing additional future analysis of outcomes.Post-16 education: outcomes for disadvantaged studentsResearch and analysisThis research compares students’ level of education and qualification route to their employment and earnings in later life. It includes information on:personal characteristics such as age, gender, disadvantagelevel of education including GCSE attainment and highest level qualification by age 25employment and earnings in the 2016 to 2017 tax yearNational Leaders of Governance for further education: national leadersGuidanceA list of current National Leaders of Governance for further education.National Leaders of Governance for further education: guidanceGuidanceGuidance on the role of National Leaders of Governance (NLGs) in supporting college improvement. It includes information on:how the new further education programme will operatewho’s eligible to applyServing governors and clerks at further education (FE) colleges are eligible to apply.Further Education Commissioner: annual report 2017 to 2018Corporate reportThe Further Education Commissioner reports on:his activity between 1 September 2017 and 31 July 2018the state of the further education college sectorIdentifying FE teacher comparatorsResearch and analysisThe teaching comparators are based on an exploratory statistical analysis of occupations in terms of:pay (experimental)working hoursdemographic profilequalificationsThe analysis aims to develop knowledge and understanding of the characteristics of people teaching in the FE sector. It also looks at roles FE teachers would likely do in the commercial sector.The research looked at data from the:labour force surveyFE staff individualised recordsannual survey of hours and earningsThe findings were crosschecked against actual labour market flows and views from sector stakeholders.Evaluation of the regional academy growth fundResearch and analysisThe Department for Education commissioned this qualitative research to understand:execution of the RAGFexperiences and decision-making of MATs in applying for the RAGFuse and effectiveness of fundingTeachers’, leaders’ and governors’ views on the pay frameworkResearch and analysisThis research was carried out in 2018 to identify and assess teachers’, leaders’ and governors’ views of the teacher pay framework. This included:the use of teaching and learning responsibility (TLR) allowancesthe main and upper pay rangehow the framework can best provide a clearer career pathway for classroom teachersThe research consisted of:a surveyinterviews with headteachers and teacherswebinars with governorsPublic sector apprenticeships in England: 2017 to 2018Official StatisticsStatistics taken from data provided by public sector organisations to the Department for Education.The statistics cover public sector apprenticeships in England in the first year of the target, 1 April 2017 to 31 March 2018.Education and training statistics for the UK: 2018National StatisticsThis statistical release contains data on education and training in the UK. It provides an integrated overview using data collected from:EnglandWalesNorthern IrelandScotlandThis statistical release has data on schools including:pupils and teachersinformation on further education and higher education institutions and studentseducation expenditurequalifications gainedWidening participation in higher education: 2018Official StatisticsStatistics providing information on three measures of increasing participation in higher education:estimated percentages of 15-year-olds eligible for free school meals (FSM) who progressed to higher education (HE) by age 19estimated percentages of A level and equivalent students, by school or college type, who progressed to HE by age 19 with breakdowns for the most selective higher education institutionsestimated proportions of young people graduating from less advantaged backgrounds on entry to HE and estimated proportions in high-skilled jobs 6 months after graduating. These statistics use the Standard Occupation Classification (SOC) at both pointsEarly years funding benchmarking toolGuidanceThe early years funding benchmarking tool and the early years proforma covers all local authorities in England. These funding tools include projected spending in the 2018 to 2019 financial year to provide early entitlement places for 2-, 3- and 4-year-olds.Local authorities can use these tools to compare their local systems and outcomes against other local authorities. They can use these comparisons to support improvements in fairness and increase value for money.Early years providers, parents and others can use these tools to:understand the early education system in their areaunderstand decisions taken by local authoritiescompare these to other local authoritiesReady reckoner and transition matrices for 16 to 18GuidanceUse the ready reckoner to calculate level 3 value-added results.The transition matrices spreadsheet shows data for the subjects included in the level 3 value-added measure.Level 3 value-added is a progress measure for school sixth forms and colleges which is used in the 16 to 18 performance tables.